I’m not much of a “stuff” person. When I move, it only takes about a car load’s worth of stuff and a couple of hours. Apart from a modest wardrobe, I don’t have much in the way of consumer goods; a hoarder I am not. The books I cherish are at my parents’ house, and I tend to quickly get rid of trinkets. However, when it comes to working out, some products are essential for maintaining motivation, staying injury-free, and overall happiness. Holding many of my prized possessions this morning before I ran. I have a Garmin 405CX, but I would buy a different one for bicycling and swimming if I were purchasing one today. The Garmin is essential for marking my progress in both speed and distance, but every so often I have to leave it at home and run electronics-free. I’ve had the Garmin since December 2010, and the quality of the product is truly top-notch. Until a few months ago, I never ran in the morning with music. It’s pitch dark out, and I don’t want to make myself vulnerable to anyone who could bother me. I wait until the sun rises to turn my music on, but my iPhone has made a huge difference in my motivation and happiness while I run. 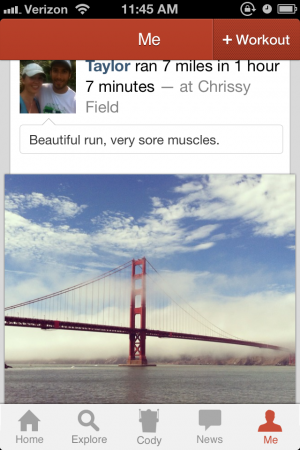 I could not have trained for this year’s San Francisco Marathon without this trusty torture device. Jesse and I try to foam roll for at least 45 minutes every night (while we’re watching Law and Order: SVU) if we’re being “good,” but we’ve both been slacking on the foam rolling and stretching since the marathon. 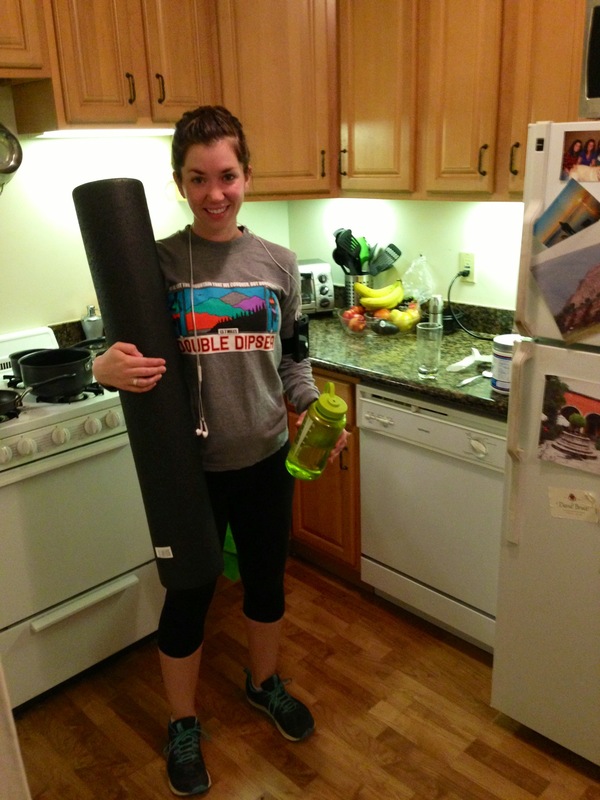 We both feel pain and stiffness in our bodies and are trying to integrate foam rolling back into our nightly routine. Logging one of my runs with Cody. My various Nalgene/Sigg/cheap Walgreens knockoff water bottles have been a staple in my life for years. I drink an obscene amount of water, and I definitely take my water bottle for granted when it’s been misplaced. Having a reusable water bottle all the time ensures I’m hydrated, which repels fatigue and false hunger signs. Jesse taught me what it means to appreciate fitness gear, and I’m trying to follow his lead in what investments work best toward my health and fitness.